Egyptian authorities on Saturday detained and imprisoned two sons of Egypt’s deposed President Hosni Mubarak in connection with longstanding charges of insider trading. 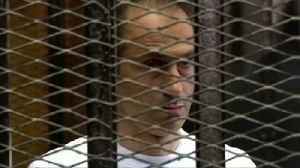 An Egyptian court has ordered the arrest of ousted President Hosni Mubarak's two sons. Alaa and Gamal Mubarak were on bail and barred from travel due to the 2012 stock market manipulation accusations. Anna Bevan reports.